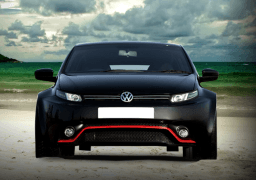 India’s biggest name in the car customization and modification industry, DC Design, took a standard Volkswagen Polo and turned it into this! 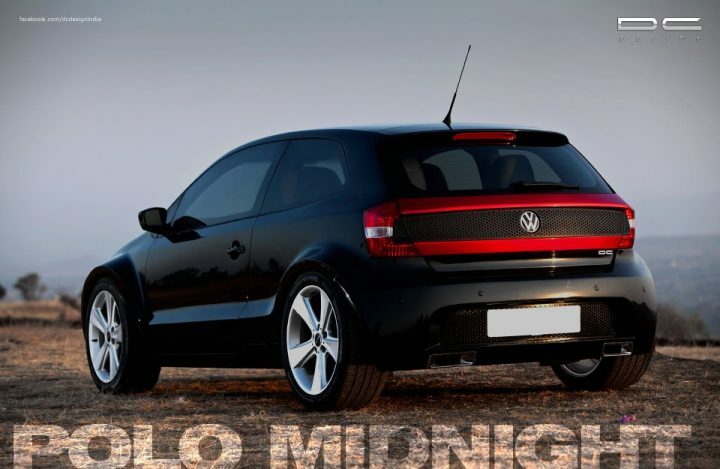 Known for their sometimes tasteful, sometimes over the top modifications, DC has undertaken some pretty ambitious projects, one of which is this modified Volkswagen Polo dubbed the ‘Polo Midnight’. DC Design was conceived by Dilip Chhabria, the man responsible for designing the Aston Martin V8 Vantage prototype, who is currently putting the finishing touches to India’s first true sportscar, the Avanti. Coming back to the Polo Midnight, the modification was carried out for a customer in Andhra Pradesh who wanted a hotter, 3-door version. 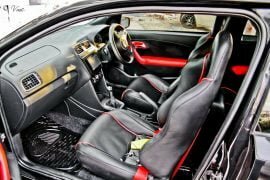 The total cost of the custom job came out to a whopping INR 28 lakhs and add to that the cost of the standard car and that figure goes upto INR 35 lakhs. That’s BMW 3-Series money! But we’re guessing the owner doesn’t care much and probably has too much cash lying around. The exteriors have been totally revamped. 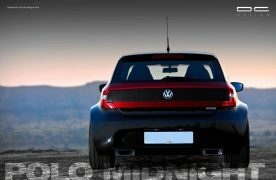 The rear doors have been chucked out to turn this Polo into a three door, they have added a wide body kit and bigger, beefier tires to give it a very sporty look.The front end has been completely changed with an all new bumper featuring red highlights and projector headlamps with LEDs. The grille is the only bit that seems to have been carried over from the standard car. Head-on this Polo, with its sleek headlamps and ultra wide wheel arches, resembles the Range Rover Evoque. Move on to the side and you’ll notice the missing rear doors and custom rims. Interestingly, the windows are now fixed and can’t be rolled down. The rear gets LED tail lamps which have been integrated very well with the red highlight that surrounds the grille like element on the boot. The rear bumper has also been redone and now sports twin exhausts and black mesh which houses the number plate. 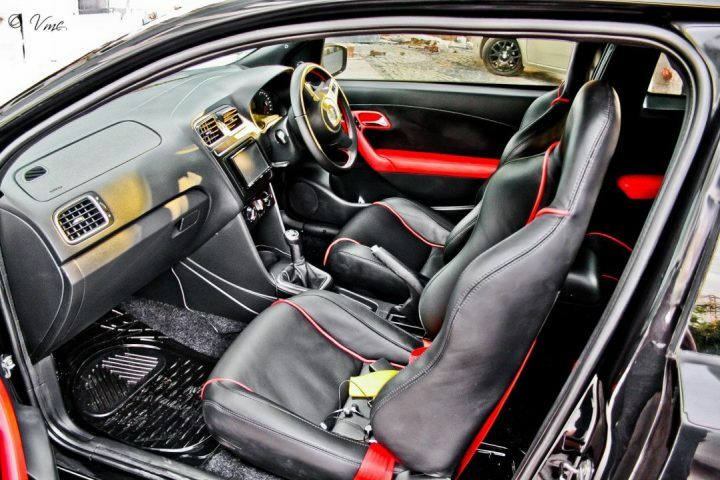 No major changes have been made to the interiors except for red highlights for the door pads and sporty black bucket seats with red highlights. The omission of the rear doors has probably made getting into the rear bench very difficult and the humongous tires have, in all probability, ruined the ride. The engine has been left untouched and the only performance additions are a performance filter and a free flow exhaust. DC Design has certainly done a very good job with this modified Volkswagen Polo. 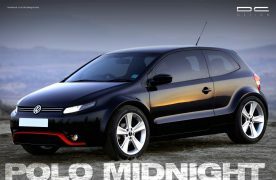 The quality of the job is top notch and the Polo Midnight does look very attractive, but the asking price of almost INR 35 lakhs is way too much. That much money can fetch you a decent luxury car or five brand new Polos! As far as the customization job is considered, top marks to DC for coming out with another head turner. 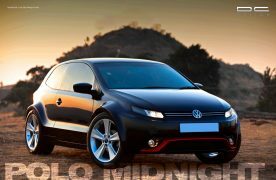 What do think about this modified Volkswagen Polo? Is it actually worth it? Let us know in the comments section below.